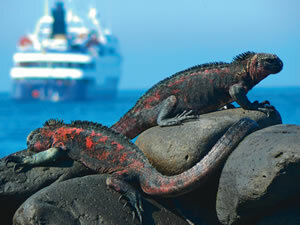 CLICK HERE TO VIEW ALL GALAPAGOS ITINERARIES! Travel back in time to the magical islands that enchanted Charles Darwin and inspired his studies. Six hundred miles west of Ecuador, for millions of years they have been home to plants and animals that have evolved and adapted to this unique environment. The islands are beautiful, but the true splendor comes from their unique place in the ecosystem and the opportunity you now have to encounter the past, face to face. A trip to the Galapagos islands is so unique and so full of monumental experiences that you should never spend a moment thinking about logistics or details. Celebrity Cruises' Galapagos adventures are blissfully all-inclusive, free of worry and planned with Celebrity luxury down to the last detail. So you immerse yourself in centuries-old landscapes and rare bird sightings, or hang out with an immense 70-year old tortoise for the day. Celebrity Cruises has taken care of everything from pre-and post-cruise stays, flights, transfers, meals, beverages, shore excursions and more. 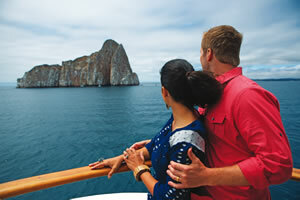 A cruise to the Galapagos Islands is infinitely different than other voyages. Smaller, more intimate, a gathering of people all bound by a fascination with exploration and ecology. You'll find large decks to gather and watch sunrises and sunsets. Elegant decor and relaxing venues. No matter which Celebrity Cruise ship you choose for your Galapagos vacation, you're covered with an all-inclusive experience. This allows you to relax, enjoy and explore this distinctive chain of islands without a worry in the world. From packages that include 5-star accommodations in Quito and luxury air transfers (to and from your ship) to award-winning shore excursions guided by expert naturalists that cover all there is to see and do on every sailing - IT'S ALL INCLUDED! Now along with the 100-passenger Xpedition, Celebrity Cruises has added two new Galapagos ships to their fleet to give you more choices for your adventure. 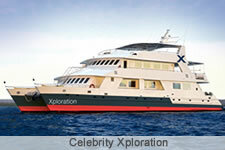 Go a bit more personal on the mid-sized, 48-passenger Celebrity Xperience or have an incredible, intimate trip via the 16-passenger Celebrity Xploration. Celebrity Cruises offers six unique cruise itineraries, 15 islands more than 30 ports of call, and multiple packages from which to choose. Simply landing on this beautiful island is one thing. Getting to know its heart, history and secrets is quite another. 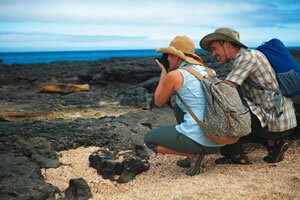 That's the kind of in-depth experience Celebrity's naturalist guides create for you. 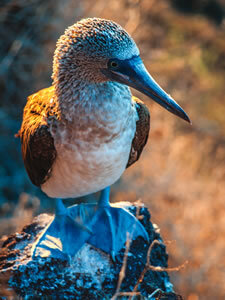 They are, quite simply, some of the best in the Galapagos. Experts in everything from science to tourism, they have spent years on these islands and some were raised in the region. Not only will the experts give you a unique view from and ecologic and geologic perspective, but also a personal view of what it's like growing up in such a special place. 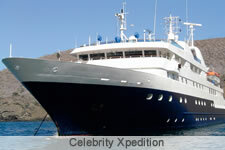 Each guide on a Celebrity Galapagos sailing will be on board during your entire cruise vacation. They're certified by the Galapagos National Park, recognizing their extensive educational training and commitment to maintaining the pristine nature of these islands. These experts are the real difference between an ordinary vacation and an extraordinary journey. Call the cruise experts at Direct Line Cruises today for assistance booking your dream cruise vacation to the Galapagos Islands. Call 1-800-352-8088 or book online.